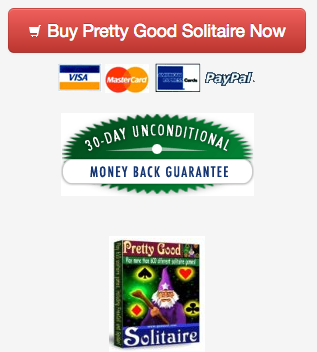 PRETTY GOOD SOLITAIRE SALE - 20% Off This Weekend Only! Pretty Good Solitaire (and all our other Windows and Mac games) are on sale this weekend only - 20% off! Just order from our site with the coupon code SPRING to get a 20% discount off the regular price of the game. All of our Windows games at http://www.goodsol.com/wingames.html and all of our Mac games at http://www.goodsol.com/macgames.html are 20% off if you use the coupon code SPRING on the order between now and the end of Monday, May 25th. In addition to Pretty Good Solitaire, our other games such as Pretty Good MahJongg and Action Solitaire are also 20% off. 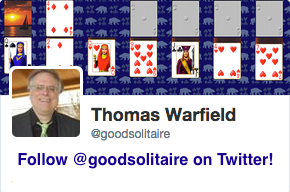 Follow Pretty Good Solitaire on Twitter at http://twitter.com/goodsolitaire . This game is at Triple Scorpion.